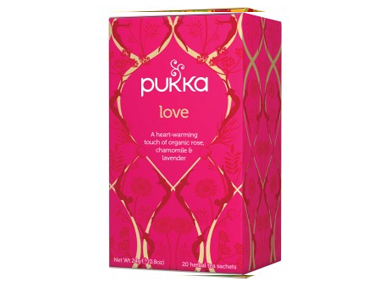 Buy Pukka Love Tea - 20 bags in the UK from our online shop or directly from our independent Scottish store. A heart-warming touch of organic rose, chamomile and lavender. Naturally caffeine-free and ethically sourced, 100% organically grown ingredients: Chamomile flower (25%), limeflower, elderflower, marigold flower, licorice root, rose flower (5%) lavender flower (5%). Where can you buy real Love Tea safely online? If you are wondering where you can buy Pukka Love Tea - 20 bags safely online in the UK, then shop with us. Love Tea - Pukka Love Tea - 20 bags in Pukka Teas and Herbal Teas.